Of the many treasures Paris Games Week uncovered is brand new open-world title coming to PC and PS4, tellingly titled Boundless. Alongside the game reveal was a brief but promising trailer, which showed off loads of stunningly blocky landscapes and players travelling between worlds via portals. If you’re looking for more games that give the player freedom, check out our feature on the best PC sandbox games. The Minecraftian game, in which players explore, collect and build across a number of worlds looks incredibly ambitious, with developers Wonderstruck saying players will be able to do anything from opening their own zoo to becoming a real estate agent. Though it’s not yet clear what will make up the bulk of Boundless’ gameplay, Wonderstruck have said the game will be multiplayer oriented and will feature PvP and PvE elements. The presence of a builder’s tool as well as the blocky, chromatic environments certainly call to mind the likes of Minecraft, Starbound and Terraria, as does the game’s ‘do whatever you want’ premise. Wonderstruck outlined their hopes for the game in an official Sony blog post, claiming their “ambition is to build the ultimate open-world sandbox filled with real players, toys and mechanics”. If it lives up to that promise we’ll be looking at a more malleable No Man’s Sky. 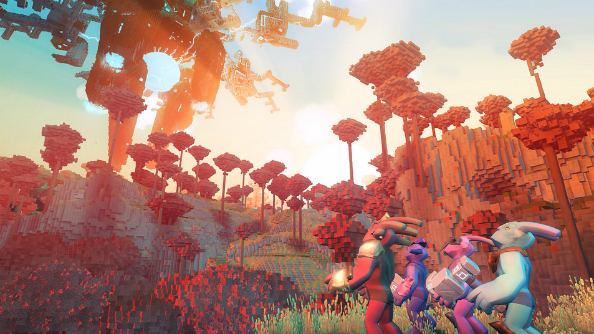 Boundless is slated for a 2016 release. What do you think of another procedurally generated, multiplayer sandbox game? Let us know in the comments below.